The name of this one has some promise and contradictions in it (from my point of view) , as it is a speyside whiskey I am expecting a smooth and gentle dram , all the while the “Burn” part have me expecting a more vibrant and powerful dram . As is with all tasting and sampling , i’ll start with the color : Light golden , smooth swirl with very faint legs . The nose is very easy , almost non existent with a very faint smell of pines . in the mouth there is a lack of energy to this dram , it is very light on the palette with a light sense of almond to the dram and a very slow and mild burn ( sadly not up to his name in the burn factor). Adding a dash of water to this dram does wonder to the nose , it comes alive with more powerful aroma of the same traces and the presence of peat. There is no change on the color which was very nice surprise , but the biggest of the changes is the taste – that small dash of water made this dram utterly bland!! (Remember , i am not using pure Scottish water for this tasting , so this might be why i got this result). All in all a light dram for the start of the evening or with a light fish dish for lunch . After a long time of hearing about this Distillery , reading many articles where people praise the dram that comes out of this established industry name , I decided to get a bottle and try it for myself. So after attempting to gather my ” Usual Suspects” for a night of sampling , and managing to find only a small section of them available , we opened the bottle and drunk. Color – Deep honey gold ,with a smooth swirl and no legs in the glass . The nose is very light on the senses but heavy on the honey aroma with a hint of pine, almonds and pepper. Tasting : The honey again is very dominant on the palate , with the hints of pepper slowly creeping in. It is very light with a nice slow burn in the back of the mouth , and a gentle slow burn in the stomach. And as in all tasting – adding a dash of water ( now I must say that the water used in this tasting are not up to the clear Scottish water standard – but that is what was available) . Nose opens up marvelously exposing a gentle exposure of many spices , and the color change to a light golden hue , which gives the dram a more alluring approach. The taste however is a different story – the gentle after burn is gone completely along with the after taste that existed before the water were added. All in all – a nice starting dram for early evening and for lovers of the more gentle whiskey , but do not add water !! Duty free price reasonable at £31.79 . Apparently Highland Park are planning to refresh their line of expressions for travel retail (duty free), replacing the 16 and 21 YO Highland Parks with 4 new as-yet-unannounced malts. Because of this new range, the days are numbered for Highland Park 16 year old and 21 year old. Both of these whiskies are being withdrawn so, if you are a fan or a collector, best snap them up while you can. They are available while the small amount of remaining stocks last. 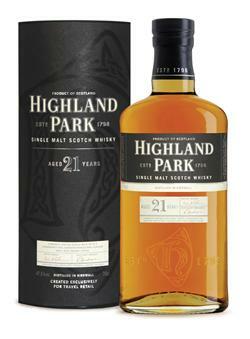 Highland Park will be selling off the 16 and 21 YO on their website for GBP29 and GBP80, respectively. Hopefully the new expressions will be both exciting and sensibly priced.